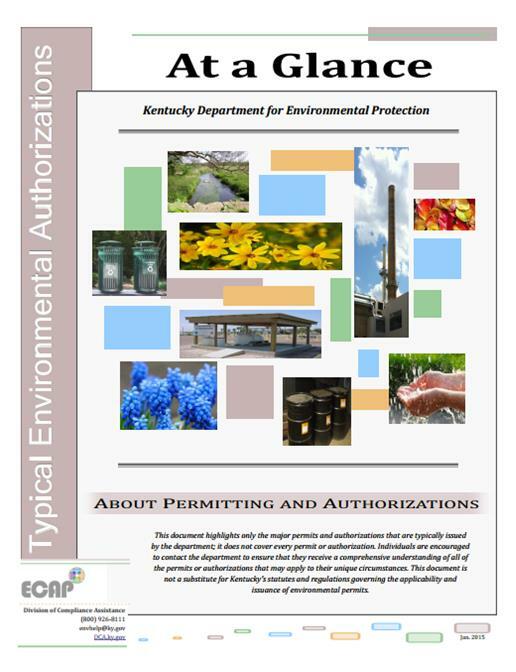 The Division of Compliance Assistance (DCA) has published a new document that covers the major permits and authorizations typically issued by the Kentucky Department for Environmental Protection (DEP). The At-a-Glance document provides information on understanding permits and the most common permits and authorizations issued by the Division for Air Quality, Division of Waste Management and Division of Water. In addition, DEP-wide resources that have been developed by DCA are included in the document, including fact sheets on Kentucky Certification Programs and Construction and Demolition Activities. The Kentucky Division of Water (DOW) has re-issued the Kentucky Pollutant Discharge Elimination System (KPDES) general permit regulating stormwater runoff associated with industrial activity. The general permit will go into effect June 1, 2013.
facilities in the Commonwealth. The eNOI for this permit can be accessed at https://dep.gateway.ky.gov/eForms/Default.aspx?FormID=30. The Department for Environmental Protection (DEP) has released a new online tool to help KPDES (wastewater) permittees determine when they must begin submitting their Discharge Monitoring Reports (DMRs) electronically using NetDMR. DEP anticipates moving all permittees that require DMR submission to NetDMR by mid-2014. As permits are renewed, permit languages will be modified to reflect these new requirements and permittees will receive a notification letter from the Department of Water specifying the date of transition. DEP encourages permittees to go ahead and search for their NetDMR due date and sign up for a NetDMR test account to practice submissions. NetDMR is a web-based application that allows permittees to electronically sign and submit DMRs. Switching to NetDMR will result in reduced paperwork, increased efficiency and improved data quality. We all might try to be perfect when it comes to environmental compliance, but in reality, it is unlikely that anyone is 100 percent perfect all of the time. If your facility has an environmental management plan (EMP), then environmental auditing practices are not a new concept. Even without an EMP, routinely auditing facility practices against permit or regulatory conditions is a good proactive measure and can potentially save you money.